Hidden inside the vast world of Dragon Age Inquisition are a few nods and references to Bioware's other big game, Mass Effect. And you know what that means, right? It's Bonkers Theory That Connects Both Games Time™. Hunting Krogan seems like a dangerous line of work, but then again, what isn't in Dragon Age? I'd say there are parallels between a scientist and a healer, but that's just me. This isn't the first time we've seen easter eggs like this in BioWare games. A DLC in Mass Effect 2, for example, features a statue of an ogre from Dragon Age. Mass Effect 1, if I recall correctly, has at least one character referencing "the maker,"—which is what people in Dragon Age call their version of god. Lets not forget that magic and biotics have a hell of a lot in common. We've also seen Dragon Age armor in Mass Effect. 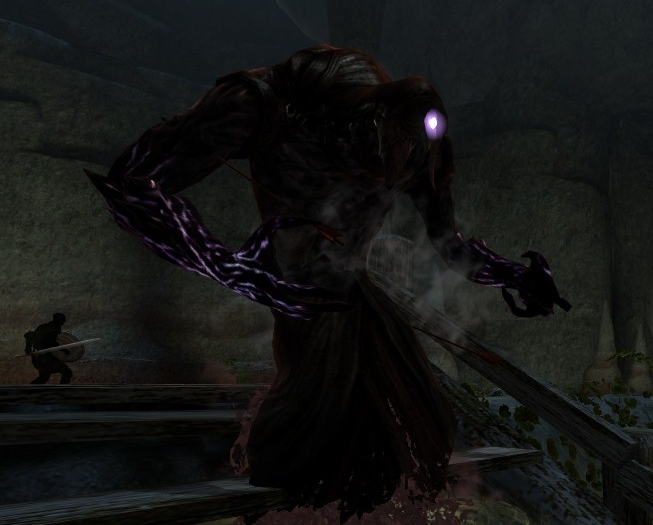 And if nothing else, we've also seen that some enemies in Mass Effect and Dragon Age have lots of similarities—the ogre in Dragon Age has an equivalent in Mass Effect (I'm blanking on the name), and the Shades in Dragon Age II looked a hell of a lot like geth. Yes, this is all probably just Bioware being cheeky with their easter eggs. Other pieces of "evidence" that I just listed are just things that show two different games were made by the same company. Nothing mind blowing! And yet what I am absurdly suggesting here is something you may have heard before: the games could be considered to be connected, they could be considered to take place in the same universe. Bioware hasn't exactly denied or confirmed this before, though they have joked about it with us. But, we don't need to have official confirmation to just have some fun with the lore. Why not? The question is whether or not Dragon Age would be set in the future or in the past. I'm partial to the idea that it's set in the future, after Mass Effect. Admittedly it's because that would be the more bonkers situation, to have the fantasy game be set in the future and the sci-fi game set in the past. As you may have noticed, I'm a fan of those types of wild theories. But, you could totally defend that idea! Redditor Necroluster notes that it's entirely possible that one of the endings in Mass Effect 3 has EDI and Joker crash on a planet...which could potentially be Thedas, the world of Dragon Age. That would be cool, wouldn't it? Hint: yes. We'll keep you updated on any other neat easter eggs we find in Dragon Age Inquisition, including the sorts that don't further silly fan theories. Let us know if you find any!